Clocking specialist PETERMANN-TECHNIK from Landsberg am Lech, offers extremely long lasting and cheap multi-use-automotive oscillators according to AECQ100, for ADAS and ASIL applications, with the series’ LPO-AUT, HTLPO-AUT and WTLPO-AUT. These low power oscillators are available in the frequency range from 1 – 137 MHz, and/or according to the version, in the temperature range of up to -55/+125°C with frequency stabilities from ±20ppm. Sample oscillators can be sent from the warehouse immediately. With a MTBF of 1,000 mil. 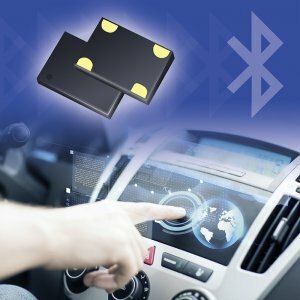 hours, combined with 50,000g shock and 70g vibration resistant, these automotive oscillators are extremely long lasting, shock and vibration resistant, and therefore optimally suited for use in all automotive applications. In order to be able to be used in EMC critical environments, the customer can fall back on the SoftLevel function. The output signal is slowed down with this function, so that a EMC damping of the 11th upper harmonic of over –60 dB can be realised. Enormous, for an adjustment that doesn’t cost the customer any extra money. To save money throughout the whole Design-in process, even in future projects, all automotive oscillators are available in the VDD area of 2.25 – 3.63 VDC. The times when an oscillator must be qualified for each power supply voltage are over. Of course, the automotive oscillators are optionally available in all common QFN casings from 2.0×1.6mm – 7x5mm. For new developments, the 2.0×1.6mm or 2.5×2.0mm 4pad casing is recommended. The specialists at PETERMANN-TECHNIK provide detailed advice, who, due to having their own application engineers, not only offer extensive technical services during the Design-in process and large scale production, but can also carry out circuit testing using the vehicle manufacturer’s standards for electronic circuits. One for all, for the good of the customer. PETERMANN-TECHNIK “your clocking expert”!